WASHINGTON - Halfway through his almost yearlong mission, NASA astronaut Scott Kelly spoke via satellite to an audience gathered at the National Press Club here about the things he is looking forward to, both for the remainder of his mission and once he returns to Earth. "I feel good overall," Kelly told the club's president, John Hughes, who emceed the event on on Monday (Sept. 14). "I definitely recognize that I've been up here a long time, and I have just as long ahead of me." Although four Russian or Soviet Union cosmonauts have broken the one-year mark, they did so in the 1980s and 1990s, with older equipment for studying how the long trips were affecting their bodies. In comparison, the ISS allows scientists to take ultrasounds, measure impairments in vision and study other biological changes that Kelly and Kornienko might undergo. "Even though the Russians have flown in Mir for longer in a couple of cases, they didn't have the technology we have today to figure this out," Kelly said. "The ISS is also a great experiment in sustainable energy and life support, and understanding how that works and how we can maintain ourselves for longer periods of time." NASA has said that a primary goal with the one-year mission is to better understand how a long journey to Mars will affect the physiology and psychology of the astronauts on board. During the interview on Monday, Kelly talked about several parts of the mission he is looking forward to, such as upcoming spacewalks to help prepare the station for docking with new commercial crew capsules being prepared by private companies Boeing and SpaceX. On days off from space station duties, Kelly watches professional football, avidly following the Houston Texans, despite a disappointing start to their season. On Sept. 14, 2015, astronaut Scott Kelly participated from the International Space Station in a discussion with astronaut Terry Virts and Kelly's twin brother, retired astronaut Mark Kelly, at the National Press Club in Washington. "Regardless of how they do, I'm a huge fan," he said. "We're fortunate to have football on the space station." But spacewalks and football pale in comparison with Kelly's long-term goal. "What I'm looking most forward to is just getting to the end of this with as much enthusiasm and energy as I had in the beginning," he said. He added his hopes to complete all of the mission objectives and science before his mission concludes. Remaining on the space station may make for good science, but that doesn't mean there aren't things about Earth that Kelly misses. He has two daughters on the planet, as well as an identical twin brother, retired astronaut Mark Kelly. The brothers said they speak regularly via the phone on the space station, and Mark will send his brother pictures of the food he is enjoying down on Earth, while Scott is stuck eating the limited cuisine options on the station. Together, Mark and Scott are participating in several scientific investigations grouped under the title of "The Twins Study," which will compare the changes that occur in both men (one in orbit, one on the ground) over the course of the mission. 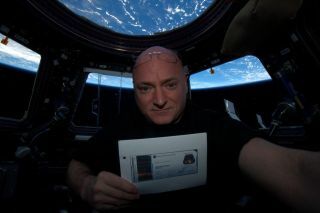 On Sept. 14, 2015, astronaut Scott Kelly participated via video link from the International Space Station in a discussion with astronaut Terry Virts and Kelly's twin brother, retired astronaut Mark Kelly, at the National Press Club in Washington. In addition to family and friends, Scott Kelly also misses something a bit more basic—"just going outside," he said. He explained that the space station is a very closed environment, where smells and sounds tend to remain the same. NASA astronaut Terry Virts, who also attended the news conference, spoke about a recent effort to help bring the great outdoors into the space station: The Russian command center sent audio clips of rain, wind and birds to their cosmonauts. According to Virts, at one point, the Russian crew played the clip of rain on every one of the 100 laptops aboard, playing the sound throughout the station for the entire weekend. "Everywhere you went, it sounded like rain," Virts said. But hearing rain and feeling it are two different things, and Kelly anticipates being outdoors when the mission concludes. "I think even prisoners can get outside once a week," he joked. Follow Nola Taylor Redd on Twitter @NolaTRedd or Google+. Follow us @Spacedotcom, Facebookor Google+. Originally published on Space.com.